Built at Cincinnati, Ohio in 1853.170 x 32.5 x 6.4.Ran Cincinnati-New Orleans, Capt. William Hamilton. 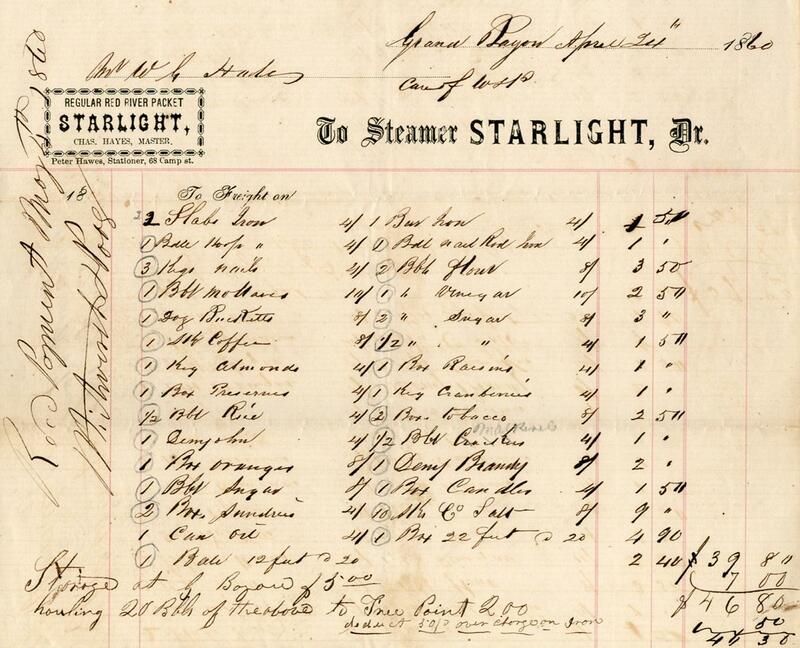 Sold December 1856 to Capt. Samuel Applegate for New Orleans-Shreveport trade. He ran her there until 1859 when he built a new hull, transferred cabins and engines over,and brought out the GRAND DUKE. 280 tons. 162 x 31 x 6 Engines, 20's- 7 ft. Ran New Orleans-Shreveport, Capt. Charles Hayes. Rebuilt after the war to measure 166.6 x 33.6 x 6.3. 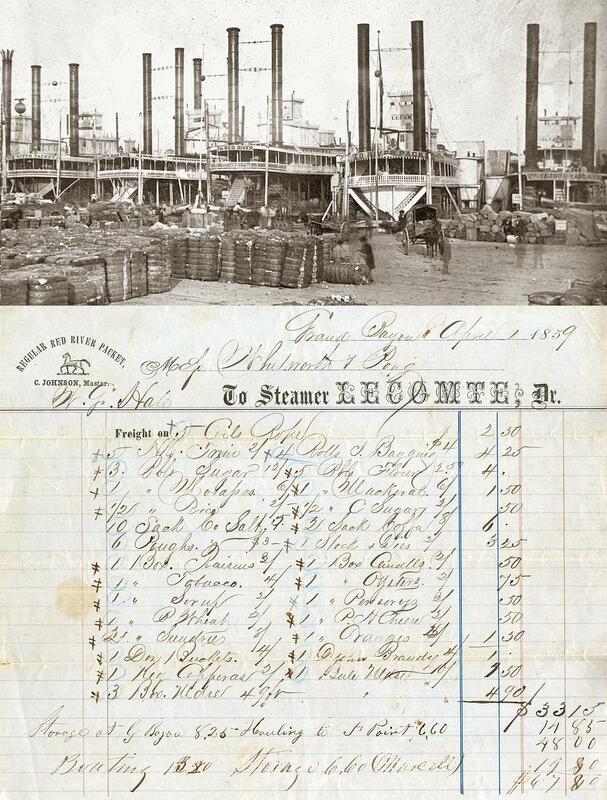 The Hayes family continued to operate her in the New Orleans-Red River trade until they sold her inFebruary 1868 to B. Simonds, New Orleans who resold her March 1868 to Capt. Daniel J. Crowley, New Orleans. Burned at Algiers, La., 23 April 1868. 324 tons. 165 x 30 x 7. First owner Capt. J. R. Davis, New Orleans. Sold June 1852 to William Cooper, Union County, KentuckyCapt. John W. Cannon, master. In 1853 Capt. L.J . Moore, Camden, Ark., became part owner and master. Burned at Bayou Sara, Louisiana., April 29, 1854 en route from Alexandria, Louisiana to New Orleans with 400 bales of cotton. Named for a famous race horse. Built at Louisville, Kentucky in 1855. 238 tons. 176 x 33 x 5.5. Ran briefly in the New Orleans - Red River trade under Capt. Cheney Johnson. Was sold to Mobile, Alabama and spent the balance of her career running to the Alabama River ports. In 1859 ran between Mobile and Montgomery under Capt. Charles Walker. Burned at Mobile, March 27, 1861. Named for the son of Captain Oscar Webster. Ran Wheeling-Parkersburg and sometimes on the Muskingum to Beverly. Next ran in the Wheeling-Clarington trade for about a year, then ran Morgantown-Fairmont on the Monongahela River and connecting with the I.C. Woodward and Columbia to Pittsburgh. In the fall of 1907, she was in the Pittsburgh-Fairmont trade. 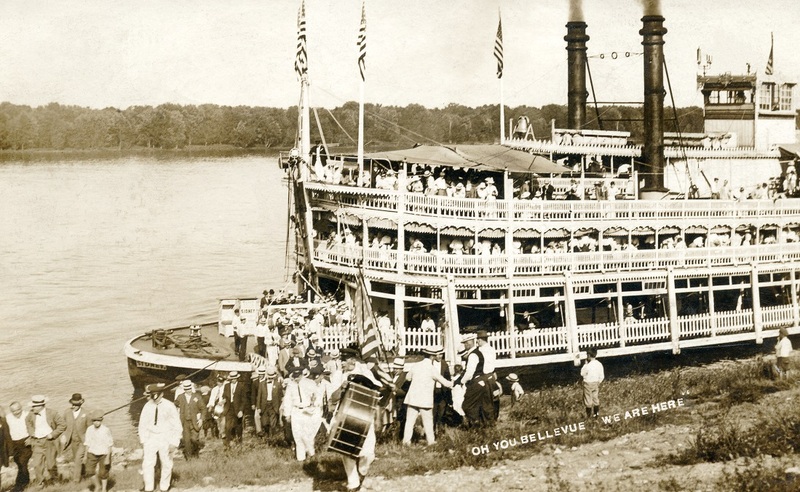 She ran excursions from Pittsburgh to Neville Island in 1908 until purchased by the Greene Line to replace the NEVA in the Winfield-Gallipolis trade. Later she ran Gallipolis-Charleston teamed up with the EVERGREEN. In 1910, while docked at Point Pleasant, her hull was rebuilt. In 1920, she ran Pittsburgh-Morgantown, then Wheeling-New Matamoras. After being sold in 1921, she ran Wheeling-New Martinsville. After being sold again in November 1921 to Donnally and Gill, she was taken to Point Pleasant to have work done on her hull. Gill claimed that he didn't order a new hull and refused to pay W.F. Smith who ran the dock. 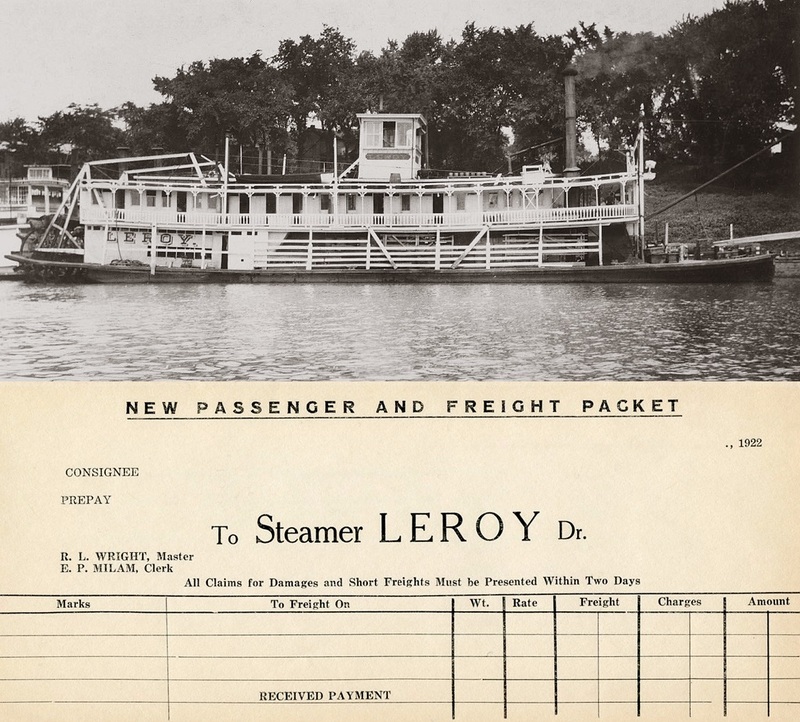 Mr. Smith eventually sold the Leroy to a sand and gravel firm at Parkersburg, West Virginia for use as a landing float circa 1925. Was built at Point Pleasant, West Virginia, 1913 - named for W.E. McDade's daughter Helen Elizabeth. In January 1918 she was carried off by ice from Point Pleasant to below Madison, Indiana, 293 miles; laid up at the time, nobody aboard. Returned under her own steam. In June 1918 a boiler deck cabin was added. Built for Captain William Stricklett and raised steam for the first time December 15, 1873. She was sold to the White Collar Line, Cincinnati on March 25, 1874. They ran her Cincinnati-Augusta-Higginsport, under Captain S. W. Morgan. She was forced ashore at California, Ohio in January 1877, by ice and drifted to Cincinnati, Ohio, when the gorge broke, she was unhurt. Ultimately dismantled. First home port was Wheeling, Virginia; running Zanesville-Parkersburg under Captain James Darlington. In 1870 she departed Zanesville with emigrants and possessions bound for Kansas, and she reshipped them at St. Louis to destination. 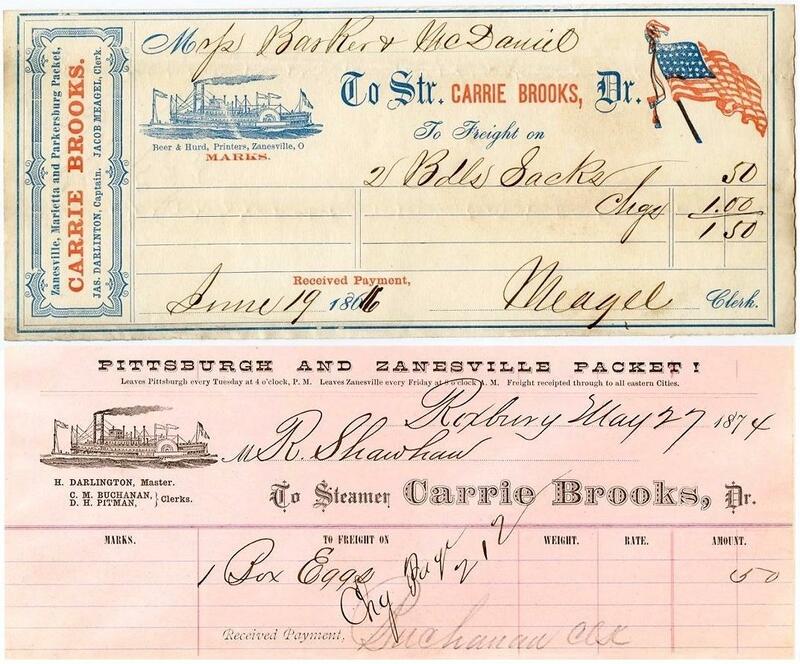 She returned to run under Captain Harvey Darlington between Pittsburgh-Zanesville during which period this waybill was filled out on May 27th, 1874 then briefly the CARRIE BROOKS also ran Pittsburgh-Wheeling. Captain John A. Trimble bought control in 1878, ran her Pittsburgh-Gallipolis, then Pittsburgh-Zanesville with not much success. 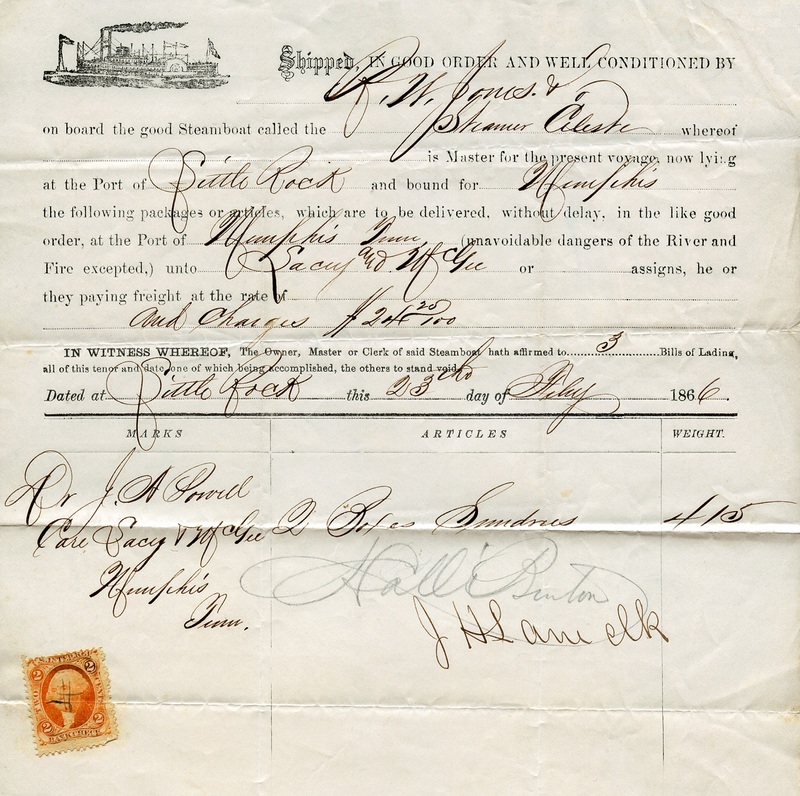 In 1878 she was sold to Captain William B. Kountz who stripped her of machinery and sold the hull to Sistersville, West Virginia, for a wharfboat. 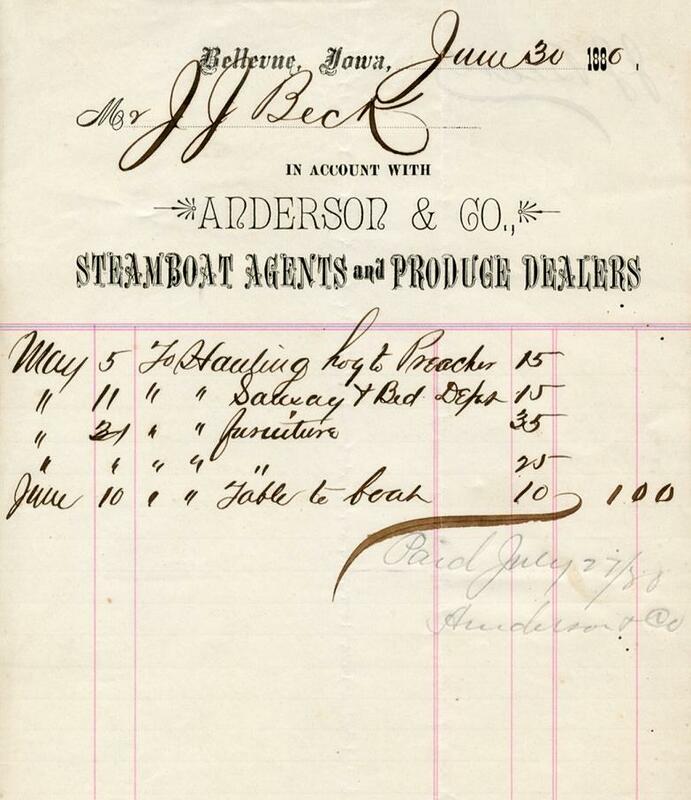 A 1916 photo of the SIDNEY at Bellevue, Iowa, the same Mississippi River town where Anderson & Co. Steamboat Agents wrote this invoice to J.J. Beck on 30 June 1880 for services rendered including "Hauling hog to Preacher" which is a great sentence, sounds like a chapter heading in a memoir about rural agriculture. 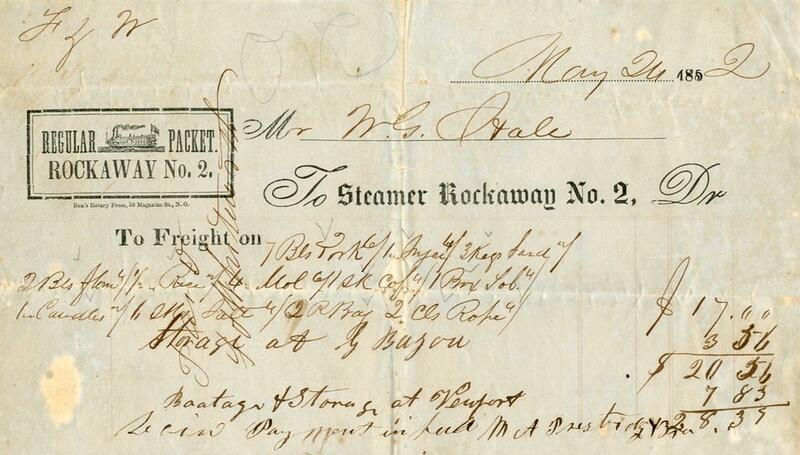 Mr. Beck got around to paying this on 27 July 1880. 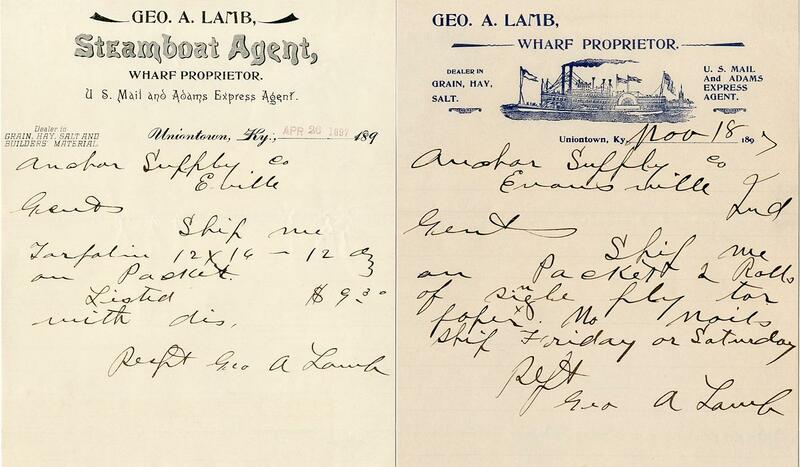 Two orders handwritten by Steamboat Agent & Wharf Proporietor George A. Lamb of Uniontown, Kentucky requesting hardware-type items from Anchor Supply Co. in Evansville, Indiana. Dated 26 April and 18 November 1897. Uniontown is on the Ohio River in Union County, Kentucky. The name derives from the fact that the city was formed by merging the towns of Francisburg and Locust Port. The John T. Myers Locks and Dam, once known as Uniontown Locks and Dam, is located downriver 3½ miles. 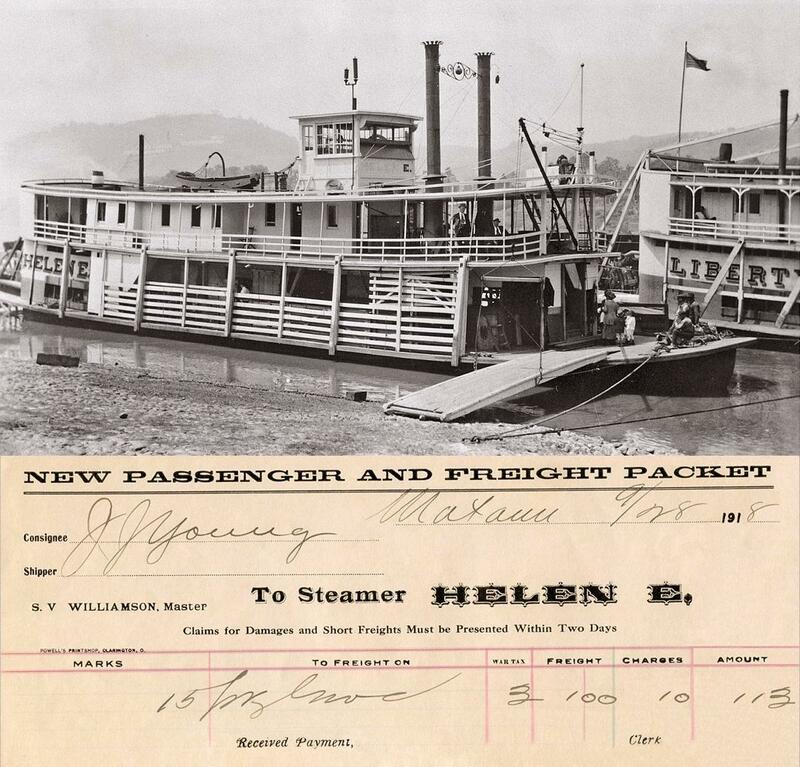 Built in 1879; hull built at Murraysville, West Virginia and completed at Wheeling, West Virginia. 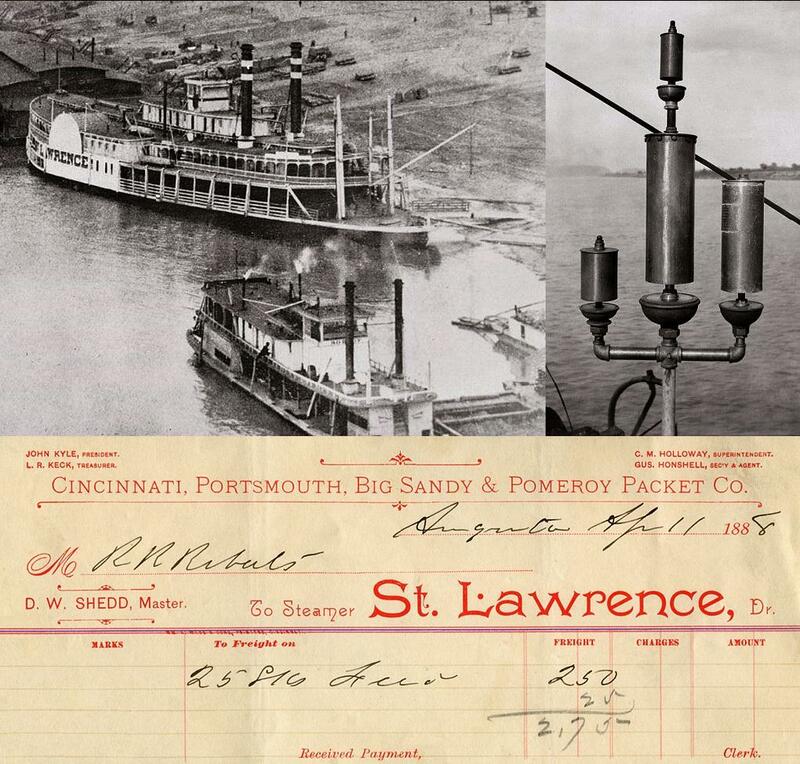 Original cost of the St. LAWRENCE was $48,000 and she came out in the Wheeling-Cincinnati trade and later extended to Pittsburgh. Fall of 1884, she was sold to the White Collar Line of Cincinnati and she entered the Cincinnati-Mayville trade. In spring 1886, she was caught in a heavy wind at Augusta, Kentucky. While attempting to turn around, was grounded on the upper side of Bracken Creek on the high shore and became stuck due to high flood waters. When the water fell, she was left stranded up high until another flood released her. Wind was also the contributing factor in her demise. On September 20, 1895, she was at the foot of Niagara Street, Cincinnati. Heavy wind tripped her spars and she blew inshore on top of old boat wreckage and sank. Her whistle was outstanding; A-flat and C, treble clef, and D-flat and low A-flat, bass clef. The three lower notes were first heard, and after a time high C came in with stunning effect. The instrument was made at Wheeling for EXPRESS NO. 2, then transferred to ST LAWRENCE which used it all her days and then it went on the sternwheel COURIER for all her days and thence to the TACOMA and was destroyed when she burned in 1922. A whistle buff of Portsmouth, Oh., Luther C. Chapman, meanwhile had made successful duplicates used on GREENLAND and CHRIS GREENE (1st), another for TOM GREENE, and at least two others. A widely circulated story is that Chapman, by trade a locomotive engineer with the N&W Railroad, once attached one of these whistles to his engine at Portsmouth, coupled to a drag of empty coal hoppers, and was well into West Virginia tootling it before a superintendent's order caught up with him to desist." Both photos courtesy of the La Crosse collection. Built at Cincinnati, Ohio in 1864. 140 x 33.4 x 4. Ran New Orleans-Red River in place of the ST. NICHOLAS during low water, Capt. J.C. Dowty, master, with A.P Rodney, clerk, November 1868. Regular in Red River 1870, owned by Rees Pritchard, Little Rock, Arkansas, and J.H. Lane, Memphis, Tennessee - Capt. Phillip Crooks, master. 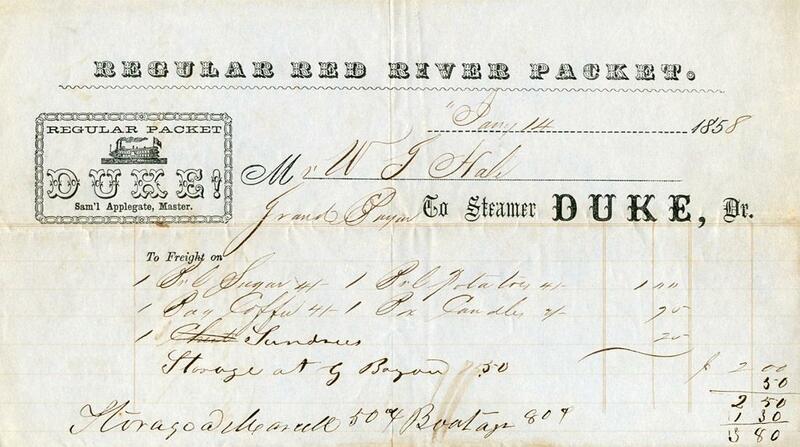 New Orleans-White River, November 1870, Capt. Pat H. Wheat. Memphis-Arkansas River, Capt. Tom Berry in 1871. Cut down by ice at Randolph Landing, Tennessee on the Mississippi above Island 35 on Dec. 24, 1872.